Maintaining strong agricultural trade relations with China is important to agriculture in general, but it’s particularly important for soybeans. Nationally, one in three bushels of soybeans are exported and the threat of losing a major market can’t be taken lightly. That’s one reason the Iowa Soybean Association sent a farmer delegation to the country this week. The delegation is led by ISA president Bill Shipley of Nodaway and president-elect Lindsay Greiner of Keota. Producers are meeting with U.S. Ambassador Terry Branstad at the U.S. Embassy in China and key Chinese officials representing soybean processors and feed companies, according to a news release from ISA. Ironically, preparations for the visit began last year, but the discussions couldn’t have come at a more opportune time. The recent tariffs on Chinese steel and aluminum imports, and possible tariffs on imports of Chinese technology and telecommunications have put trade relations between the U.S. and China on shaky ground. 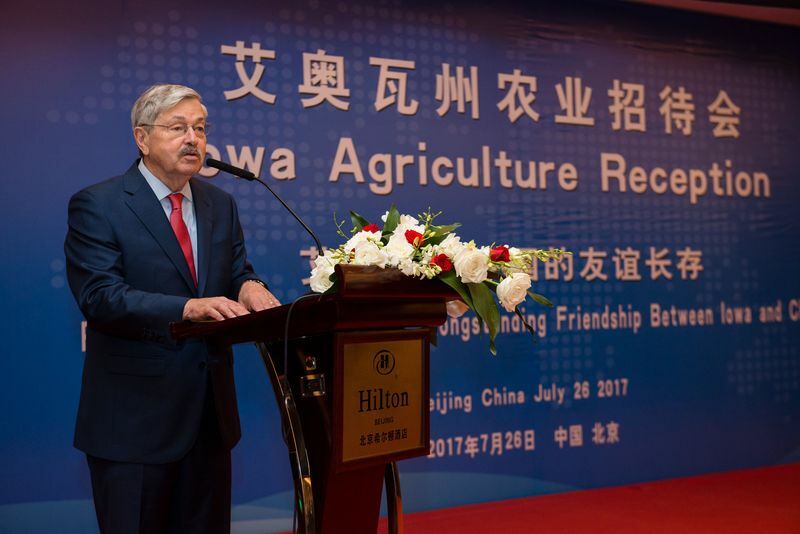 Former Iowa governor Terry Branstad is U.S. ambassador to China, which is a benefit to agriculture. He has had a good relationship with Chinese leaders for years. Yet farmers are fearful agriculture could be used as a pawn in a potential trade war. “China, which wasn’t even in the market for soybeans 16 years ago, is now our largest customer, purchasing more soybeans than all others combined,” Shipley says. “Iowa soybean farmers, with the support of their association and investment of the soybean checkoff, have developed strong relationships with Chinese soybean buyers, industry representatives and the Chinese government. The ISA continues to work with Iowa’s Congressional delegation in communicating concerns about the way tariffs are being proposed and their potential impact on soybean farmers and U.S. agriculture.